Education is an important part of our mission at the Fort Worth Nature Center & Refuge (FWNC&R). It is our goal to educate our community about the importance of preserving our natural resources. Individuals are unique and have different learning styles; for this reason, we provide a variety of options. Nothing can replace learning about our natural world by being immersed in its beauty. Our staff can supplement classroom curriculum with real examples in the wild. Groups that visit for a field experience include public schools, private schools, home school groups, scouting groups, civic groups and more. If you cannot make a trip to the FWNC&R, one of our naturalists can visit your school or group. We can bring some of our animal ambassadors and artifacts to enhance your educational experience. We are often invited by groups throughout the Greater Fort Worth area to share information about the FWNC&R. We are happy to come out to your event to share our Mission with your participants and promote outdoor learning experiences. In a typical school year schedule, students have breaks for the holidays and the summer. During these times we provide programs the entire family can come out and enjoy. Some of our programs during the holidays can include specialty hikes, canoeing and our famous Bison Feeding Hayrides. 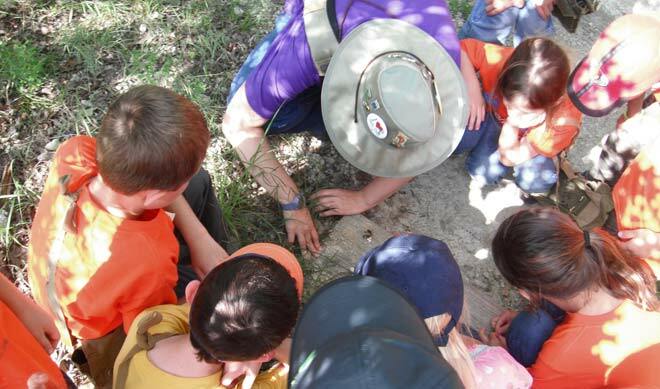 During the summer, when children are out of school, we offer summer camps for students to experience the outdoor world and learn about the many facets that makes nature so special and important. If you are interested in scheduling for any of the above experiences, please contact the Hardwicke Interpretive Center at (817) 392-7410.